Lakewood Auto Body is a family owned and operated auto body paint and repair shop serving the community of Milton, WA since 1962. We are a full service facility offering auto body painting, custom auto painting, auto body repair, auto detailing, and mechanical auto repairs under the same roof. We are noted in the region for our car and truck painting Isuzu. Our highly qualified, trained and experienced paint techs are ASE and I-Car certified. 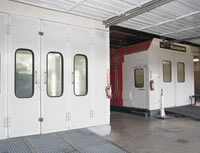 They use the latest technology and tools such as computerized paint matching systems, duel side-by-side paint booths, etc. to help them deliver top quality auto paint services. Lakewood Auto Body has always run its business based on honesty, integrity, and commitment. Our dedicated and sincere services have taken us to the pinnacle of the truck and car painting industry of Milton, WA. Don’t get your prized Isuzu vehicle painted by just any amateur auto painter with a spray gun. To bring the original look back on your Isuzu, hire specialists like Lakewood Auto Body. Be it car painting Isuzu Rodeo, or truck painting Isuzu NPR-HD, the auto body painting offered by us is the region’s most efficient, dependable and long-lasting paint services. General auto repairs such as engine overhauling, repair of exhaust, suspension, AC systems, etc. The truck and car painting Milton services delivered by Lakewood Auto Body are unsurpassed by any auto paint shop in the region. We stand by our services and offer a lifetime warranty on all auto body paint jobs. Even if you had your truck painting Isuzu H-Series done by us long time back, we will honor our commitment. Timely, economical and durable paint services. Highly skilled paint techs specializing in truck and car painting Isuzu. Free auto detailing with paint jobs. Cutting edge technology and equipment used. Use of high grade paint, enamels and industrial finishes. Contact Lakewood Auto Body at 253.581.0220 and avail the most reliable auto painting services in Milton, WA.